In October of 2014, the ABA partnered with Rockjumper Worldwide Birding Adventures to offer a new kind of event called the ABA South Africa Safari. That safari was such a resounding success we’re trying it again, but this time in India. Join us in February 2016 to search for Tigers, to behold the majestic Taj Mahal, and to discover India. Here are the Top 10 Reasons to register today for the ABA India Safari (click here). On everyone’s bucket list, the iconic “crown of palaces” located in Agra was built over 22 years from 1632-1653. It required the work of about 20,000 people to construct, and is today perhaps the most famous building in the world. A UNESCO World Heritage Site, it was originally built as a shrine to the Persian princess Mumtaz Mahal, who died while in childbirth. One of the most famous wetlands in the world, the birding spectacle at Bharatpur can be unsurpassed at times. Conditions vary from year to year, but always there are numbers of waterbirds, and sometimes there are incredibly huge concentrations. Once a duck-hunting area for the maharajas, today it is protected as Keoladeo National Park, a world heritage site, hosting Northern Shovelers, Gadwall, Cotton Pygmy-Geese, Tufted Ducks, Painted Storks, Asian Openbills, Indian Darters, various eagles, and animals like nilgai, golden jackal, and even striped hyena. The snappy-looking Bar-headed Goose is a fascinating and unique waterfowl species, famous for migrating at amazing heights. Rumored to migrate even above Mount Everest (which peaks at 29,029 feet asl), these geese have been documented regularly migrating above 20,000 feet, making them one of the world’s highest-flying birds. Bar-headed Geese have a larger wing area than other geese which aids their flight at high elevation, and they have also evolved the ability to breathe efficiently in thin air. Meet the Rockjumper Staff & Guides! Rockjumper guide David Erterius counts migrant birds. Adam Riley, world renowned as a birder, guide, and photographer co-founded Rockjumper in 1998, which today operates more than 250 birding tours annually. Adam made headlines in India in 2014 when he captured some of the first imagery ever of a Snow Leopard on the hunt. Other Rockjumper guides who will be on hand in India include the “Big Swede” David Erterius, Forrest Rowland, Cuan Rush, and Glen Valentine. Founded in 944 and declared a UNESCO World Heritage Site in 2013, Ranthambhore Fort is the former hunting grounds of the Maharajahs of Jaipur. Rising 700 feet above the plains the fort offers great views of the surrounding area, and was a strategic site in the history of this part of Rajasthan. 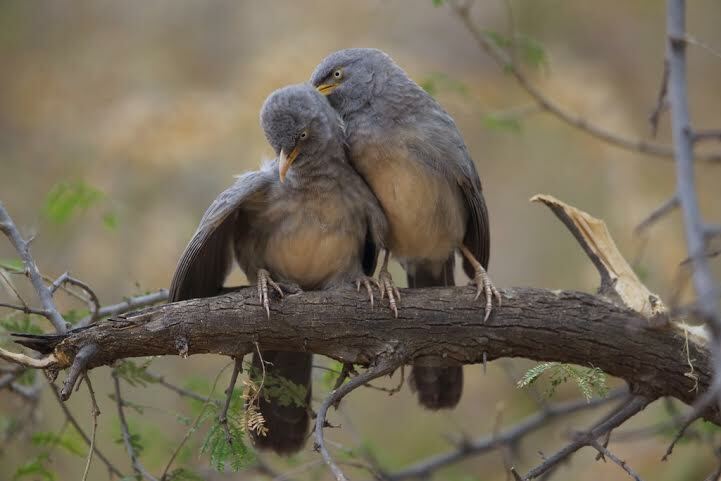 Though modestly attired in a plain muddy brown plumage, the alert pale eyes, and gregarious habits of the Jungle Babblers given lend them some palpable personality. A conspicuous feature of gardens, forests and farms in India, usually they are in groups of half a dozen to a dozen. This member of the laughingthrush family (Leiothrichidae) are known as the “seven sisters” or the “seven brothers” in Hindi for their social and noisy habits. At six feet tall the Sarus Crane is the tallest flying bird on earth, and India is the stronghold for the species. Revered as a symbol of romantic devotion, it was considered taboo to eat or kill these cranes. Newlywed couples are often taken to see a pair of Sarus Cranes to witness their ardor and behold the sacred species’ elegance. Pairs are believed to mate for life and when a member of the pair dies the other is believed to be so devastated that it then starves to death while pining away, emitting great bugling calls. The common name Sarus is derived from a hindi word that means “lake bird” and the Sarus was in close contention to be named the national bird. 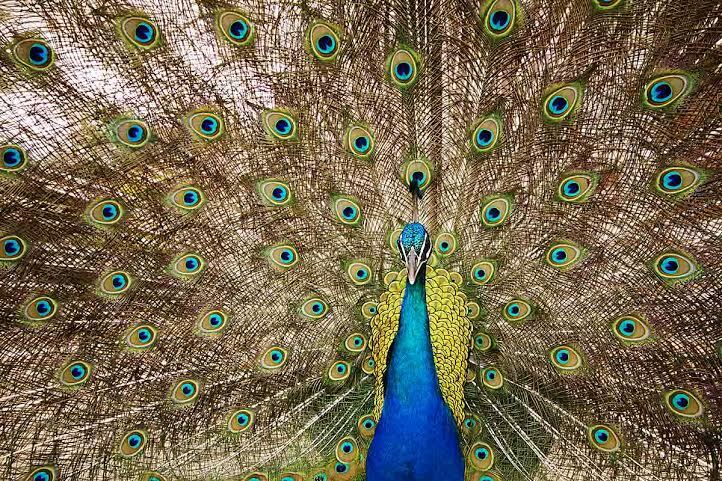 You know it as the “peacock”, familiar to all of us as an elegant avian import to rural areas across the country, their far-carrying raucous call is heard around farms and also in movie and television soundtracks. Wild peafowl in India gather and feed in small flocks called “musters”, usually with one male and several females, and the displaying male is arguably the most the spectacular bird on earth. Its gaudy plumage along with its elegant carriage led to it being named the national bird of India in 1963. It fans and quivers its ridiculously ornate, ocellated plumes in display. The function of these elongated upper tail covert feathers remains debated, but they are used at least in part to attract females. The ultimate quest animal, this noble, imposing species is so utterly captivating that its name is one of the very first words we learn as toddlers. The largest cat in the world, once widespread throughout much of Asia, today is endangered with fewer than 4000 thought to remain in the wild. But it persists in numbers in certain places including Ranthambhore National Park, and with four days in the park safari attendees stand a good chance to see one, or perhaps more. The best reason of all to join this unique event, however, is you! All you ABA Members are good people, smart and friendly. Come join your friends for an adventure to one of the most intriguing and culturally rich countries in the world. Together we can explore a foreign land, gaining some perspective on our home country in the process, and create new connections and opportunities along the way. ABA Events always offer great birding and camaraderie, and India will supply a bounty of new sights, sounds, and personal discoveries. Adventure awaits! Register now by clicking here!